There has been a significant increase in new cancer immunotherapies. The Science journal called cancer immunotherapy, 2013 “Breakthrough of the Year” and Nature published an outlook article titled, “Calling Cell To Arms.” These publications highlight the progression and growth of the cancer immunotherapy research field. Vaccine therapies, antibody therapies, immune checkpoint inhibitors, and adoptive cell transfer therapies are all strategies within the immunotherapy research field aimed at enhancing the immune system’s ability to fight cancer. Adoptive cell transfer (ACT) therapy focuses of using the patient’s own cells for therapeutic treatment. Within ACT there are three major therapeutic approaches that use cells to directly target and stimulate the immune system: Tumor-infiltrating lymphocyte (TIL), T-cell receptor (TCR), and chimeric-antigen receptor (CAR) therapies. Although the approach to immune system stimulation is different from one therapy to the next, they all use and require primary, purified, and clinical samples. Whether plating cells for an ELISA or proliferation assays or working toward isolation of TCR from humanized mice, these samples are routinely processed and re-processed for downstream experiments. At each step, measurement of cell viability and concentration remains an important element in the immunotherapy therapy development process. Every Cellometer instrument is capable of performing the trypan blue exclusion method. After staining the cells with trypan blue, and loading the sample into the counting chamber slide, the Cellometer instrument automatically captures and analyzes multiple cell images. 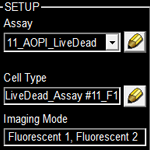 Within seconds, the result table displays the live, dead, and total cell concentrations, percent viability as well as the average cell size. Dual fluorescence-based instruments (Cellometer Vision, Auto 2000, and K2) are capable of measuring the concentration and viability of nucleated cells in clinical samples without the need to perform red-blood cell lysis. Just 20 µl of sample is added to the Cellometer Counting Chamber. 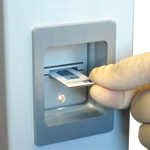 Imaging and analysis of the samples is completed in 30 seconds or less. Bright field and fluorescent cell images can be viewed to check cell morphology and verify cell counting. Total cell count, concentration, and mean diameter are automatically displayed for each counted sample. First step in the isolation of tumor-infiltrating lymphocytes (TILs) is the excision and digestion of the tumor sample. Use Cellometer to determine concentration and viability of TILs to plate for T-cell isolation post tumor digestion. Secretion of IFNγ by TIL indicates tumor specific response by the isolated T-cells. An ELISA assay is performed to test for high levels of interferon-γ (IFNγ). Use Cellometer to determine concentration and viability of T-cells needed for an ELISA assay. Expand selected B-cell clone for hybridoma production. Use Cellometer to determine concentration and viability of antibody producing hybridoma B-cells. Use the Cellometer to determine the concentration of cells needed to seed for viral vector production. Use the Cellometer to determine the concentration of cells needed to seed for testing of the produced viral vector. Collect patient’s peripheral blood lymphocytes for T-cell isolation. 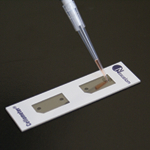 Use the Cellometer to determine the viability and concentration of the collected PBMC sample. Patient’s purified T-cells are often cryopreserved before they are transduced or transfected with a vector containing the cancer-specific t-cell receptor. Reprogramming CD19-Specific T Cells with IL-21 Signaling Can Improve Adoptive Immunotherapy of B-Lineage Malignancies. Harjeet Singh et al. Cancer Research; 71(10) May 15, 2011. Lentiviral vector containing an eGFP reporter was added to the cells at different concentrations: Control (no viral vector), Sample 1, and Sample 2 (images shown below). The Cellometer instruments are capable of performing concentration, viability and cell size measurements of cultured and primary cell lines as well as perform more complicated cell based assays that are routinely used during the development of cancer immunotherapies. With bright-field and fluorescent platforms, these robust instruments are capable of performing consistent and accurate cell measurements for a large variety of samples. Dual fluorescence-based units (Auto 2000, K2, and Vision) are capable of measuring the concentration and viability of nucleated cells in clinical samples without the need to perform red-blood cell lysis. For isolated or purified cell samples the bright-field trypan blue Cellometers (Mini, Auto 1000, and T4) acquire multiple images, and automatically report the percent viability, cell concentration, and average mean diameter in under 30 seconds. Together these instruments cover every cell counting need that researchers may have in the immunotherapy field. Manuri PV, Wilson MH, Maiti SN, et al. (2010) piggyBac transposon/transposase system to generate CD19-specific T cells for the treatment of B-lineage malignancies. Human Gene Therapy 21(4):427-37. To see publications citing Cellometer instruments used for measuring cell viability with AOPI or TB, please see our Viabilty application page.